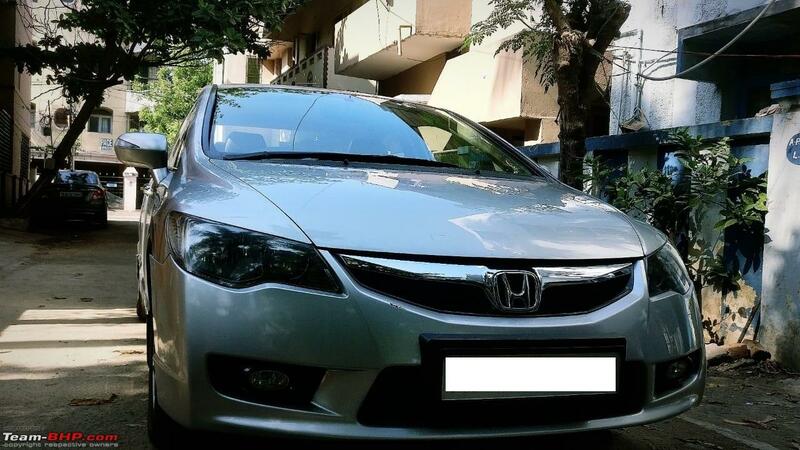 It started way back in 2006, when I had a year between me and legal age to drive when Civic was launched in India. The same year, my family could finally afford to buy a new pearl silver WagonR LXi. The wagon R was an upgrade to our '95 Premier 118NE. The WagonR served us for 8 years flawlessly and it was in 2014, we needed a bigger car for our family. 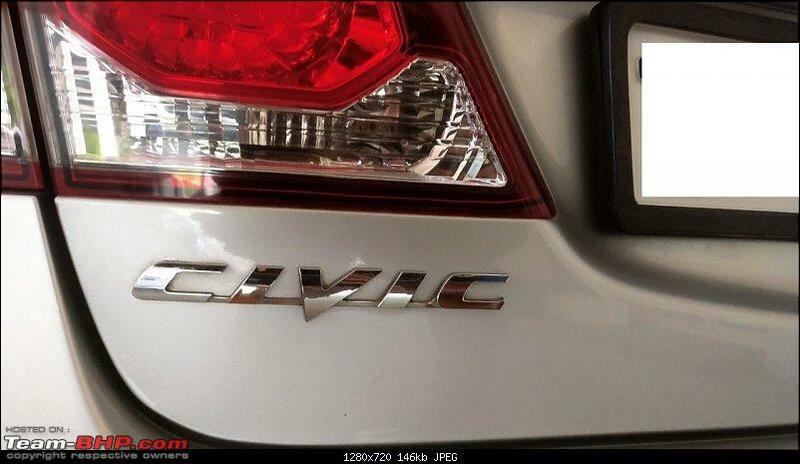 Now, we could afford to get us a Civic but, Honda pulled the plug on the Civic in India. With not so great experiences with our old and used 118NE, my parents had a mental block against used cars. Though I showed many good samples of Civic, they were rejected without a second look at the dining table by my parents. This is when we bought our new Vento Highline TDi, the last batch of 1.6 TDis sold in India. (Spoiler alert, I got to know that my Vento is writing her experiences with our family with 55555 Kms on the odo). More on that when Vento completes her post. We were happy with the Vento and my dad, my younger brother and I used the Vento whenever it was available for us. My dad had the priority rights over the keys of the Vento as he is a old man, dedicated his life to the family and deserves the car more than me or my brother. My brother and I used to plan our week in order to get our fair chance behind the wheels of the Vento. It was then I moved to Gurugram for work and Vento was shared between my dad and my brother. In the meanwhile, my brother passed out of college and had a job in hand. His work place was 37 Kms from our place of residence and my mom used to be very paranoid whenever he rides his mad machine, the RC390 to work. I was making good progress with my career and I could afford a car. However, I used to stay exactly 290 meters away from my work place and I could easily walk down. My weekend trips in north India were taken care of by my Thunderbird 500 and for trips with friends, we used to rent cars from Zoomcar, Voler and others of that kind depending on available offers. 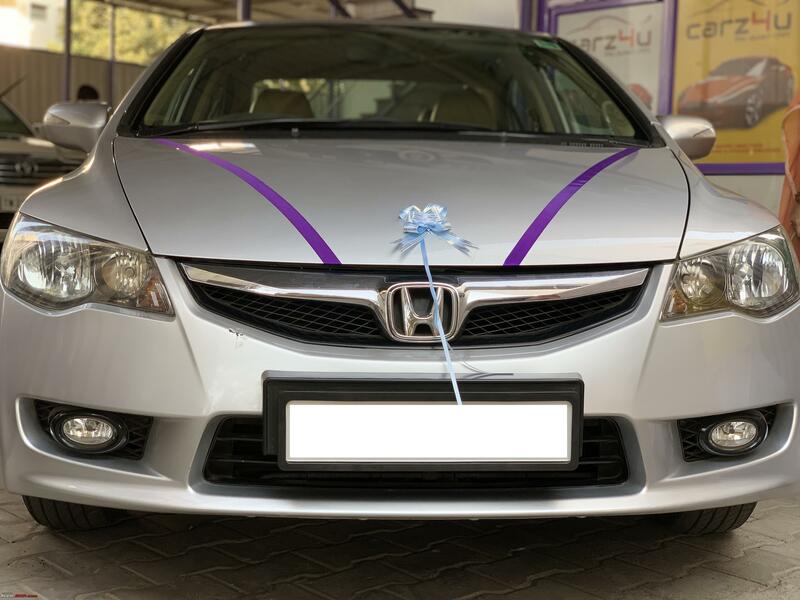 So, I decided to gift a car to my family where my dad and my brother can use either of them depending upon their need. The hunt began. At this point, I would like to highlight the role Swift has played in our lives. When we wanted to upgrade from our Wagon R, our logical upgrade was a Swift. However, my brother and I spanning over 6 feet in length , could not exactly fit inside a swift and we decided, we needed to move to a segment higher and finally ended up with the Vento. (I believe, Vento will cover that in much detail in her biography). Again during our hunt for the second car, we almost decided on a Swift ZXi. We then visited the Fiat showroom and got a Emotion Multijet Punto for almost the same price. The enthusiasts in us made the obvious choice and we brought home our Italian beauty, the exotica red Fiat Punto in September of 2015. Life was all good when I suddenly started feeling home sick and made 3 to 4 trips from Gurguram to Chennai every month. Working out the financials and to satisfy my emotional needs, I moved back to Chennai in February 2018 with a good Job in a reputed company. This is the point where we were almost in a same situation as we were in 2014. Just that the equation earlier in 2014 was one car for three people and now we had 2 cars for three people. However, now that my dad had retired from his regular job and he was working for just 15 days a month at the max, we were somehow managing the situation with two cars. Within two months of commuting 40 kms everyday, and Vento being my preferred steed, the heavy clutch started to show it's true colors and I started to realize the need for an automatic car. While looking at great reviews of the Honda Jazz, I got a car which was only 6 months old, with 4000 kms on the ODO for a great deal. With eyes closed and a short test drive, I bought the car. It was an absolute impulse decision which was well repented later on. The Jazz is a great overall package. However, for a family that has experienced Volkswagen and the Fiat for quite some time now, the Jazz had the following drawbacks. 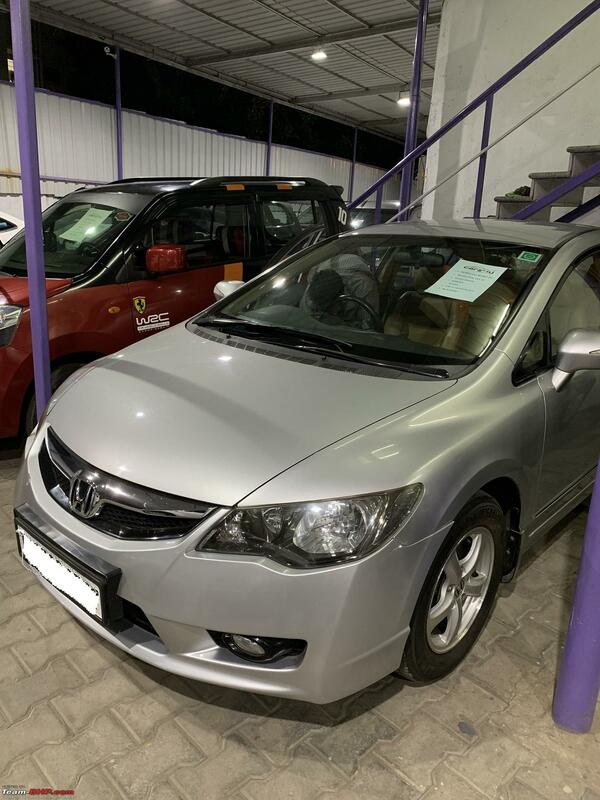 I had posted sometime back in the following link on why it was a bad decision for me to buy a Jazz and why an overall good package didn't work out for me.Click to read (Bringing home the new member: Story of our Honda Jazz!). As a result, I sold the Jazz after having her for 7 months and having done 7000 Kms. The buying and selling resulted in a loss however, I got it straight on what to look for in my next car. 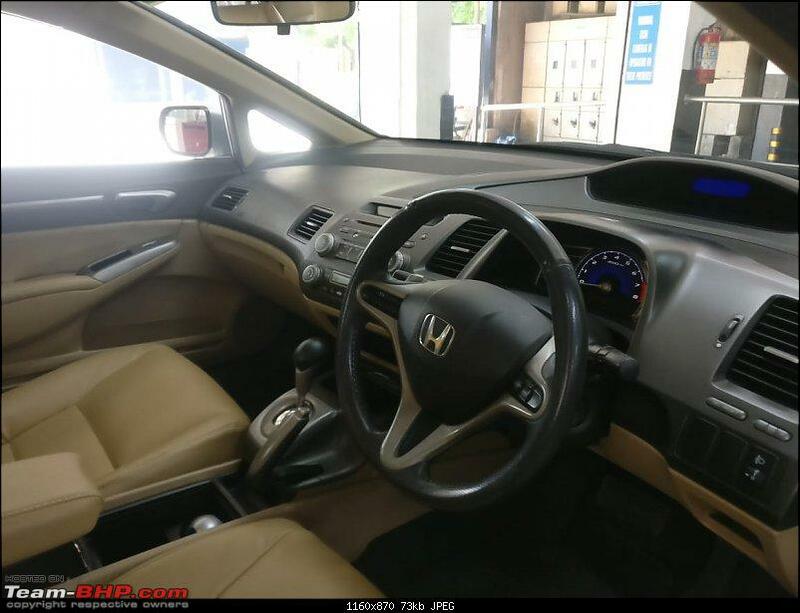 With Honda's CVT 1.2 combination considered the best in the segment and this same combination not suiting my needs, I immediately rejected i20 and Baleno automatics as the other two were CVTs as well. With Figo's launch around the corner, I was very eager to check it out and wait for it no matter what. 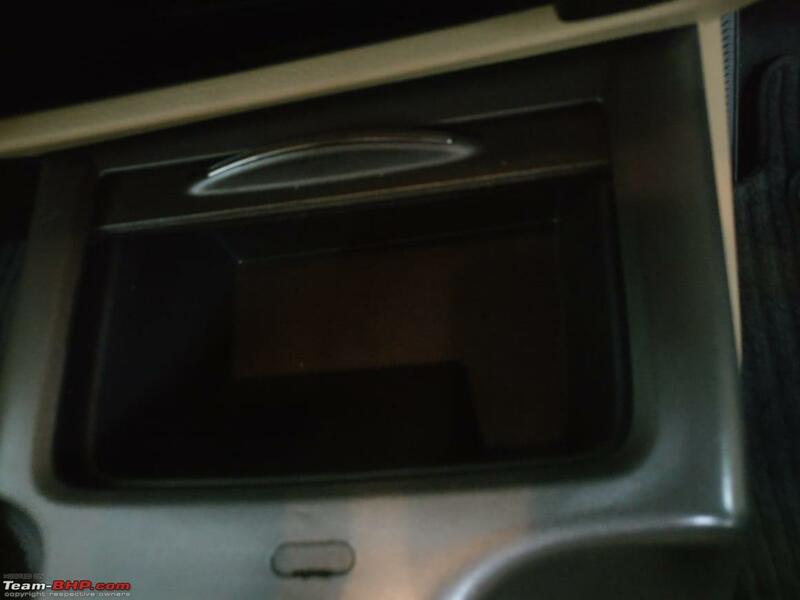 The Ecosport's 1.5 with the auto box combination getting great reviews on our community supported my decision to wait for the Figo and not proceed with my buying again. Finally the Figo was launched and I test drove the car. The car was beautiful and these were my observations. The observations are totally based on what I was looking for in the car. 1. The engine was super responsive. It was silent at lower RPMs and the sound of the engine was a true treat to the ears when revved. 2. The gear box was mated well with the engine and shifts were hardly experienced when driven with a light foot. 3. The audio was good, not the usual great audio I've experienced in bigger Fords. However, i could live with it. 4. I wasn't expecting anything more than 10 Kmpl so, average wasn't a concern. 5. Ford's tall claims of lowest maintenance costs in the segment were reassuring. 6. The car was practical as I was able to seat someone behind me as well with my relaxed driving position. 7. The car didn't scrape on any of the usual speed humps even on full load. 8. Descent and usable boot, though this was never a factor to decide on the car. 9. The wheels were a tad bit small and I thought I need to upgrade this immediately. 10. My mom did not get the plasticky feel she got in the Jazz so, she approved of the car after the test drive. 1. What about the resale value? The other two cars we own are a total mess at this. Are you not ready to consider this factor? 2. What if the facelift also flops at the market and you see Ford selling Figos at a discount in a couple of months after you buy the car? This made me put a hold on the Figo purchase and set me thinking. I went to test drive the Swift AT and to my surprise, it was available in the ZXi+ trim. I requested for a testdrive and the car was brought home. However, the car was a ZXi AGS while I was promised a ZXi+ AGS for the testdrive. The mechanicals remaining the same, I checked out the car and it was a typical Maruti. Jack of all trades. However, it answered both the questions of my dad very well. 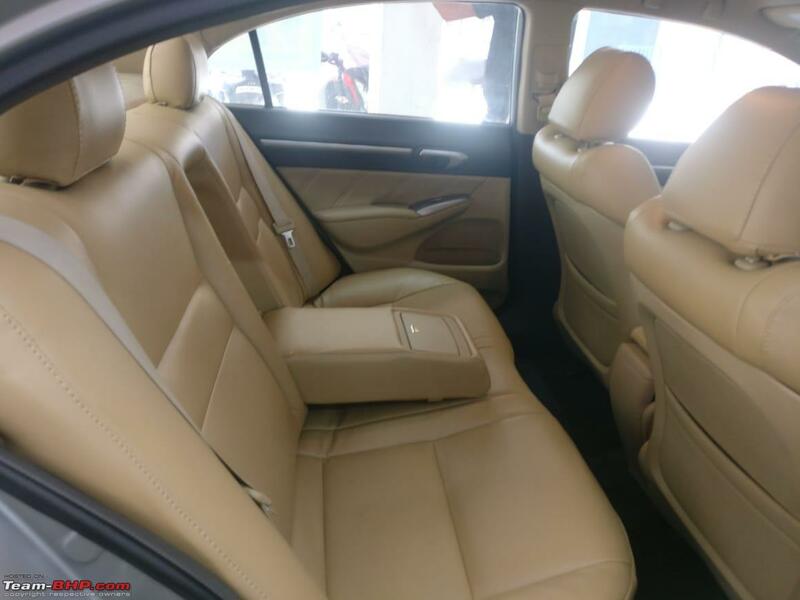 Then I sat with the SA on negotiation and the price of the car at 9.30 lacs on road Chennai, did not do any justice to what it offers. We bought the Vento at 11.7 and the Punto at 7.3 and could not figure out what the Swift was superior at to charge this kind of a premium. Also, the AT was very Jerky and the car was all Jazz'y' again with the flimsy build quality. 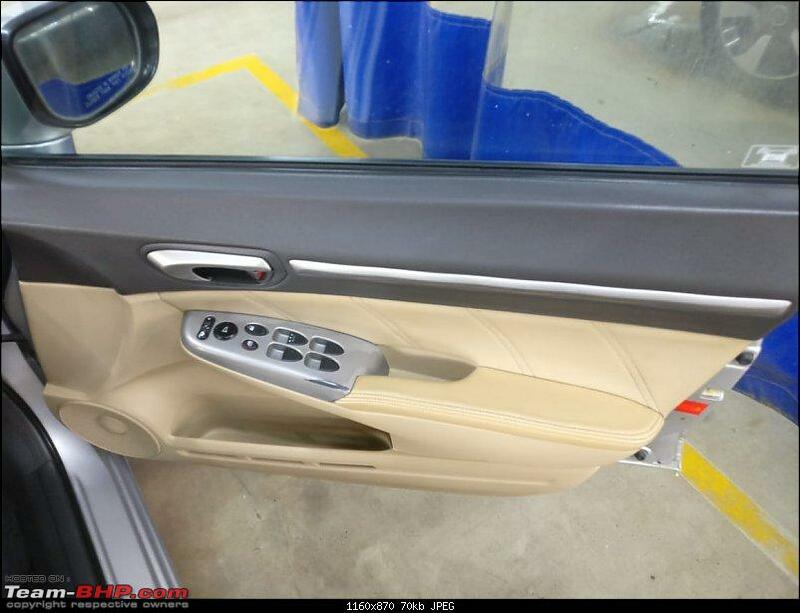 Also, in my opinion, for a car scraping the million rupee price tag, the quality of materials used were very sub par. I am sure the Vento has spoiled me but, I did not want to pay that kind of money for what is on offer. 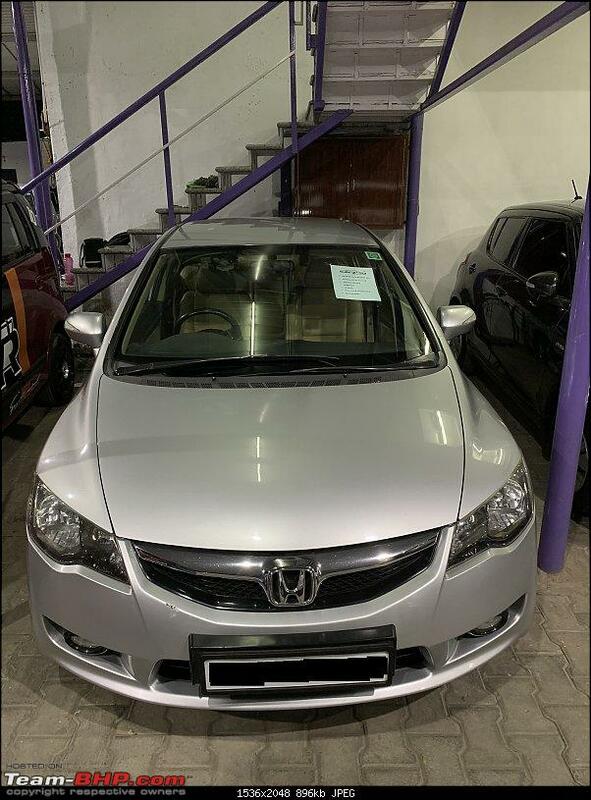 So, I decided, pre-owned cars was the way to go to satisfy all my needs and this time, I will take my own sweet time to decide on a car and I would not make any mistakes. 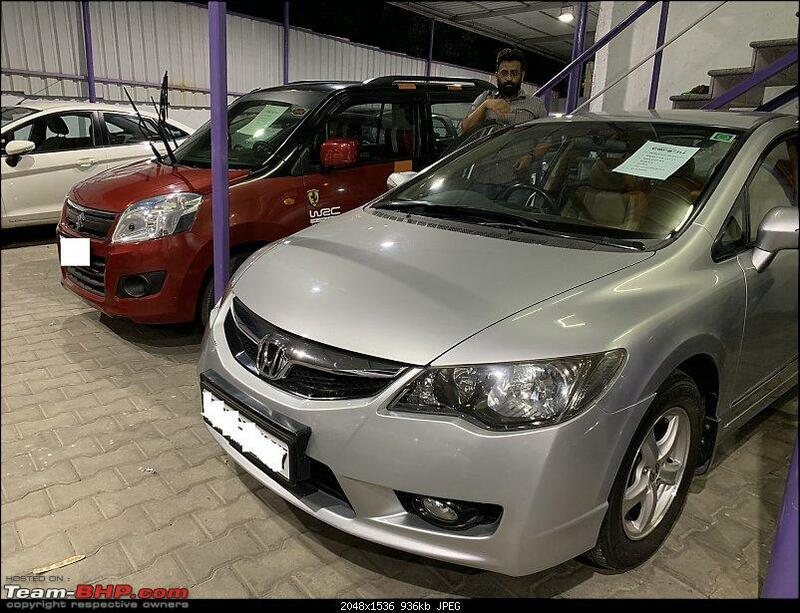 Before buying a used car, the post in Team BHP "How to buy a *USED* car in India" documents everything that you have to consider and it is worth it's weight in Gold! 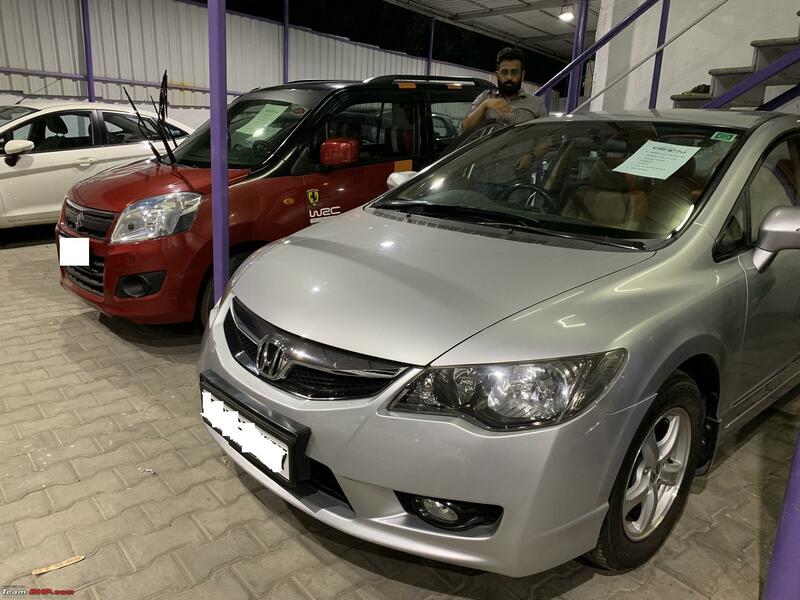 I urge everyone to go through this thread once again even if you have read it before if, you are in the market to buy a used car in India. I have gone through this thread over 5 times so far. So, on a less productive day at work, 25th of March'19 to be precise (I am sure my boss is not on Team BHP ), I was browsing through used car listings in Chennai. 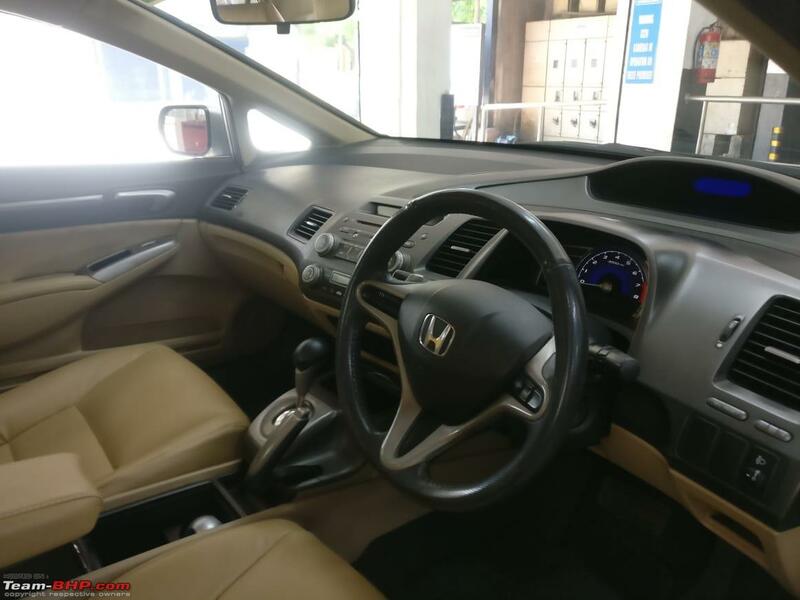 I was somehow inclined towards the Honda city, though a CVT, a better integration and the combo works better than the 1.2 CVT combo in my opinion and experience and Global Fiesta DCT. 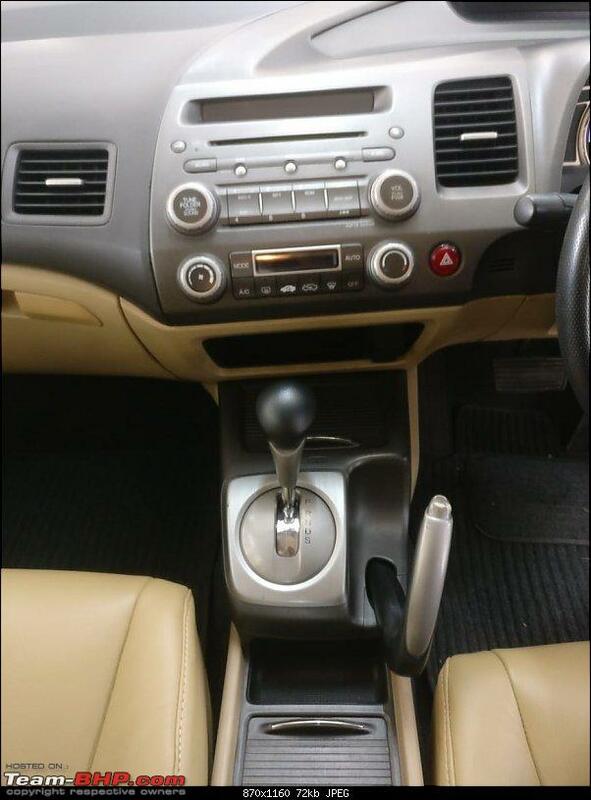 I found a couple of good listings of Honda City on OLX and one single "terra Beige" sort of colored Fiesta DCT. I was casually sharing the listings with my brother who also apparently had a sluggish day at work. He didn't comment on any of the listings I shared but, He replied back with a link which had this face on it! 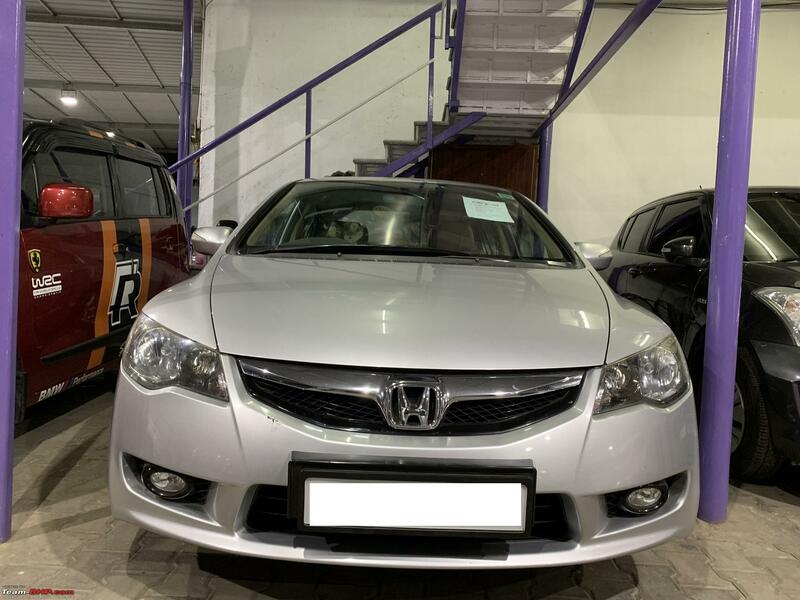 I immediately called the number mentioned and the dealer replied saying already a couple of people are interested in that car and he urged me to take a look at it the same evening. My brother and I had gone to work in a Friend's 328i and had to give it to a known garage for full body respray. The car had so many dents and scratches and we get to see it so many times. At one point in time I told my friend, you fix the scratches or I will do it. The very sight of the car makes me sad. He finally agreed to fix the car and gave it to me. So, we dropped the 328i and immediately took an auto to reach the dealership where the beauty was parked. And there she was hiding behind a couple of Fortuners and Crystas! 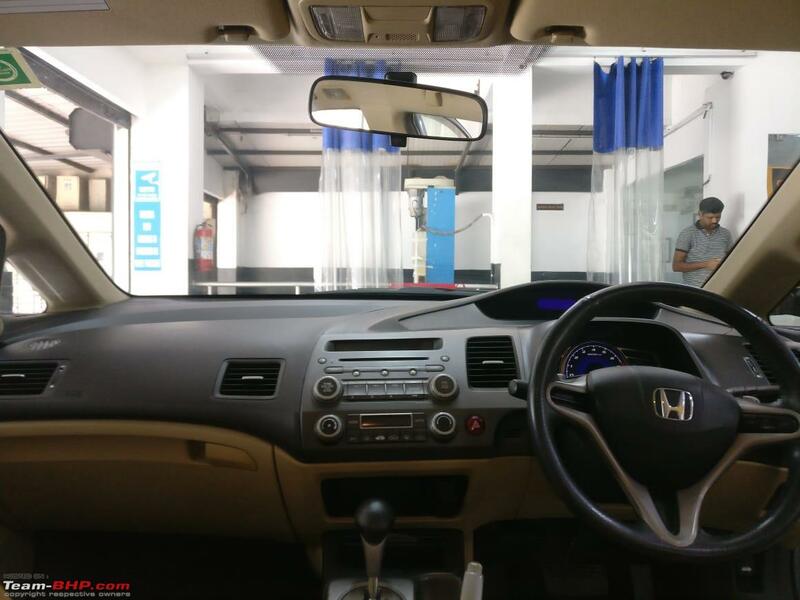 The dealership is Carz4U in Arubakkam in Chennai. My brother and I introduced ourselves and we were given the keys to the car and no one disturbed us for almost an hour. 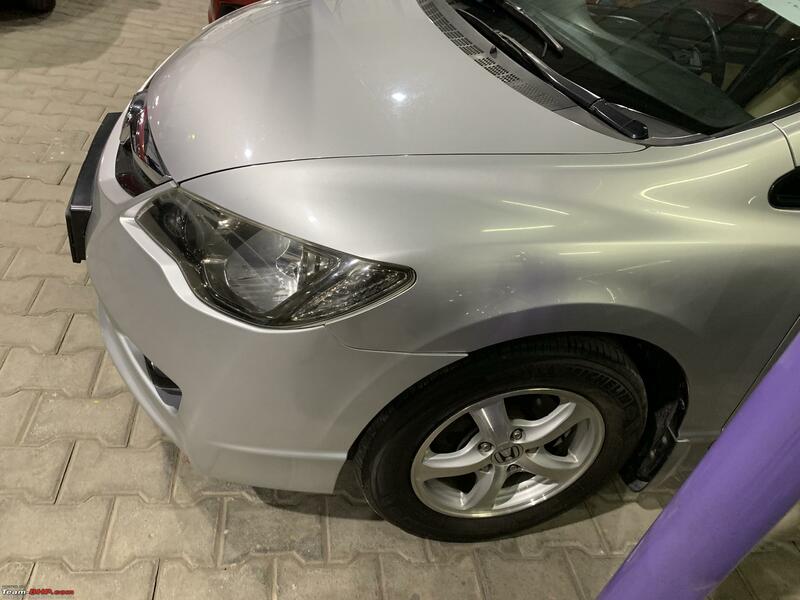 The car was carlocked by other cars in the garage and there was no way to take her out without dislodging at least a half a dozen other cars. We checked out the car completely and went inside the office of the dealer. The dealer showed me all the papers he had starting from RC, insurance, complete service history and also the record of changing the tyres at 46K kms at the Honda service centre itself. The previous owner was supposedly a very organized man and he has account for every litre of fuel filled and Kms run at each filling. 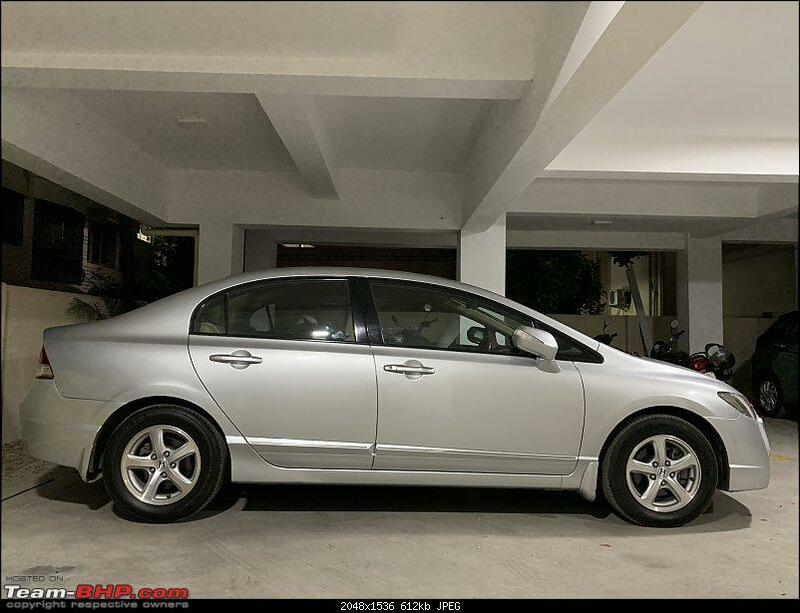 The dealer suggested, me to spend the next day with the car, take it to a Honda dealership, get it completely checked, take it for a long test drive and come to a conclusion. All these were too good to be true for me, the way the dealer is behaving, the records, the documentation and so on. 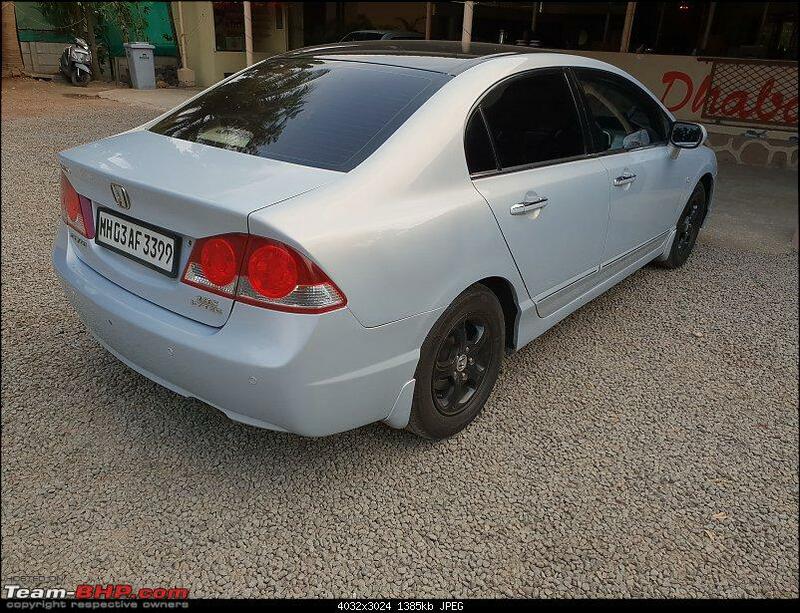 The civic was a 2012 registered car with 50K kms on the odo. I immediately sent out a leave intimation to work for the next day and so did my brother. We went back home however, I was silently praying that the car should be good else all our dreams would be shattered! The engine started up at 1100 rpm and settled at an eerily silent 800 rpm idle. I adjusted seats, steering and mirrors to my driving position. Pretty easy work and i got into a comfortable driving position. Civic has the organ type A pedal (the first car I might own to have this) and the dead pedal could easily accommodate two large legs! Slotted the gear into "D" and she started to crawl. A dab on the throttle and she responded so well. The steering reminded me of the Punto, not so direct but, it was heavy. 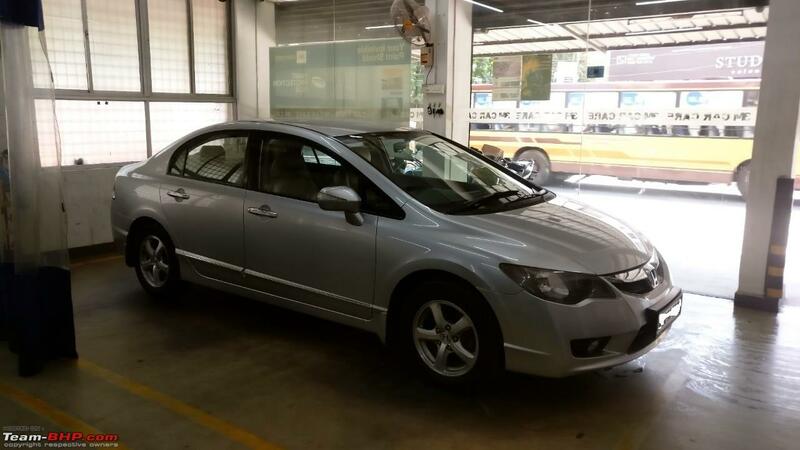 Within few minutes of Driving, I was so comfortable with the car and I reached the dealership. I had booked an appointment and I was appointed with a SA named Prabhakaran whom I knew from the Jazz days. he told, they'd charge Rs. 2000 for the check up and you know what, this is the best 2000 rupees I have ever spent in my life. I remember reading the same words from GTO's post on his 530D where he had spent Rs. 8000. 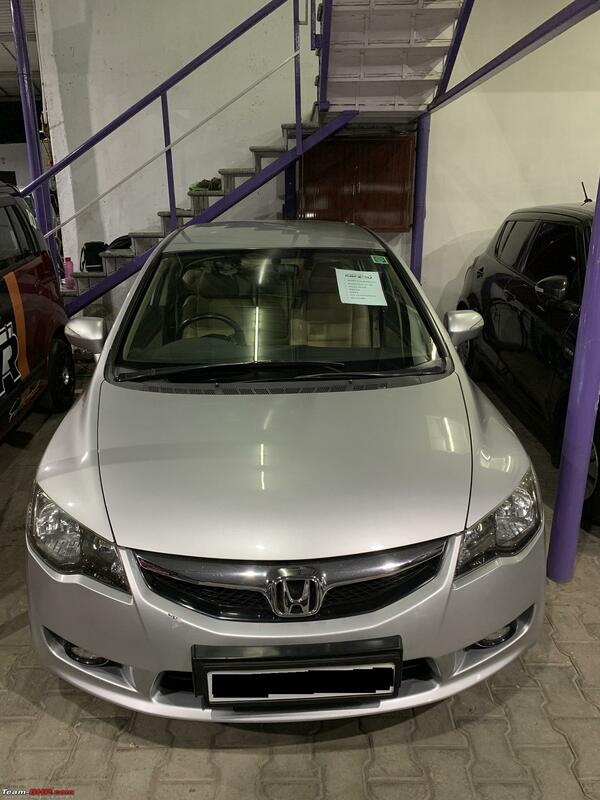 While the car was being checked, I sat down with the SA and checked the service logs of the car, checked the insurance and claim records as the insurance was with Honda Assure. To my surprise, there were no claim records and the current insurance was running with 60% NCB. The car's body also revealed this. Except for a few stone marks and minor scratches in the bumper area, the car is clean with stock paint from the factory. As I was waiting at the service centre, I checked out the new civic. 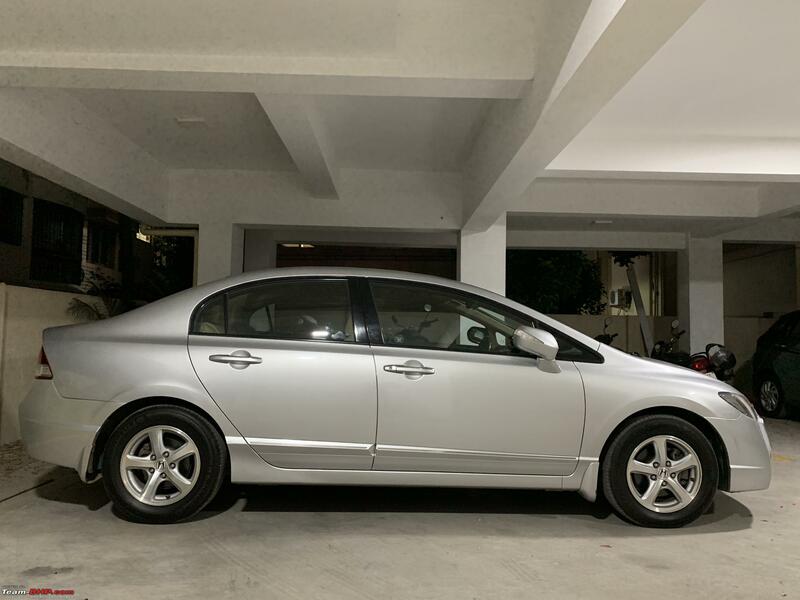 Except for a few new Gizmos, I didn't feel the new Civic to be quite an upgrade for the old civic owners and sure the quality of the overall car has deteriorated. 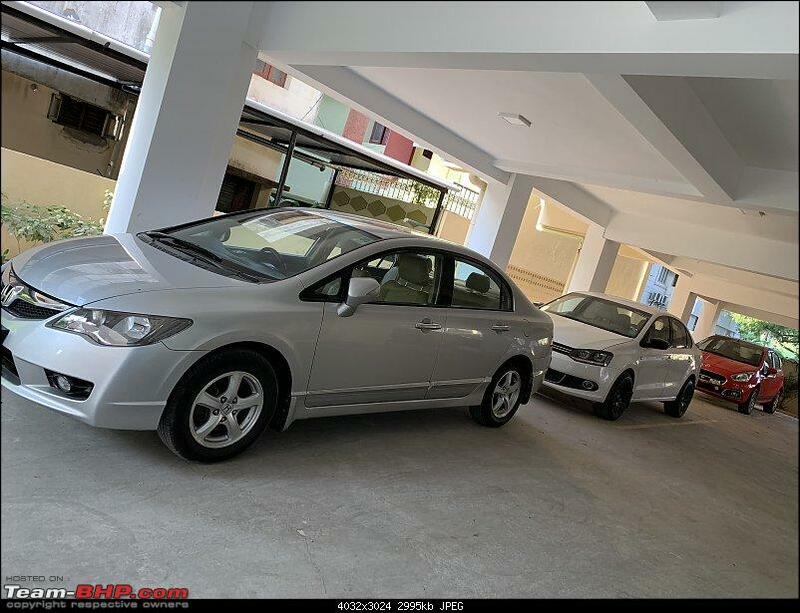 I am resonating the thoughts of fellow BHPian Civic owners and I have read the same on multiple ownership threads and maintenance threads here on teamBHP. 1. 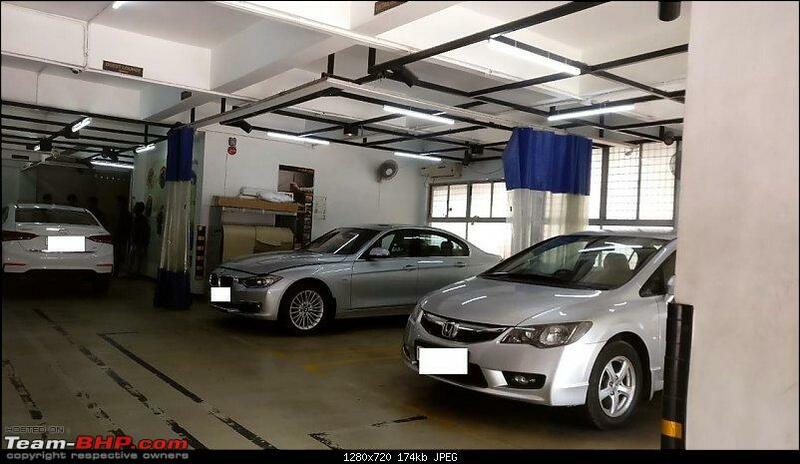 The engine mounts have to be changed in another 20K Kms, which will cost approximately 8.5K INR. 2. The rear door rubber beadings have to be changed in another 10K kms. 3. The wipers need replacement. I had two routes to reach Anna Nagar, where my home is. Come back the city route or take the Chennai Bypass. 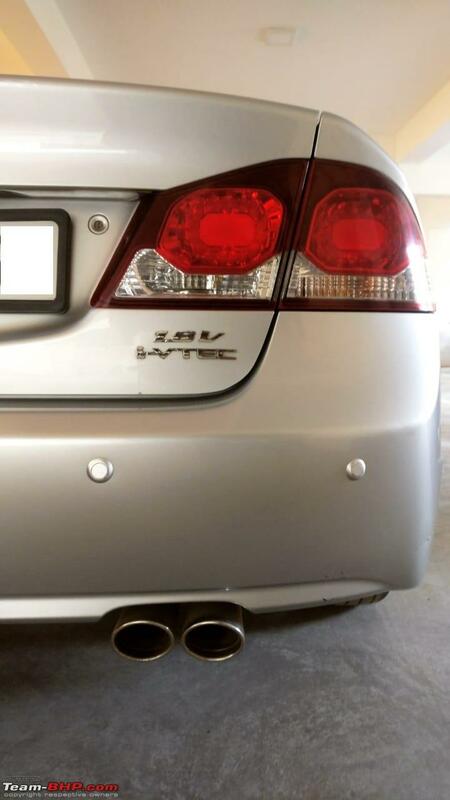 I took the obvious choice and took the bypass to test the "VTEC Kicked in YO!". My initial driving experience was fantastic. It was both comfortable and fun-filled at the same time. The car touched ridiculous speeds before I could realize. The slush box however, is slow to react and paddles comes in Handy. After a combined test drive spanning over 60 Kms, I brought the car back home for my grand parents, parents and wifey to get Civiced. On the way back, my brother, the driver and I had a small chaat break and we were good to go for another few hours without food. 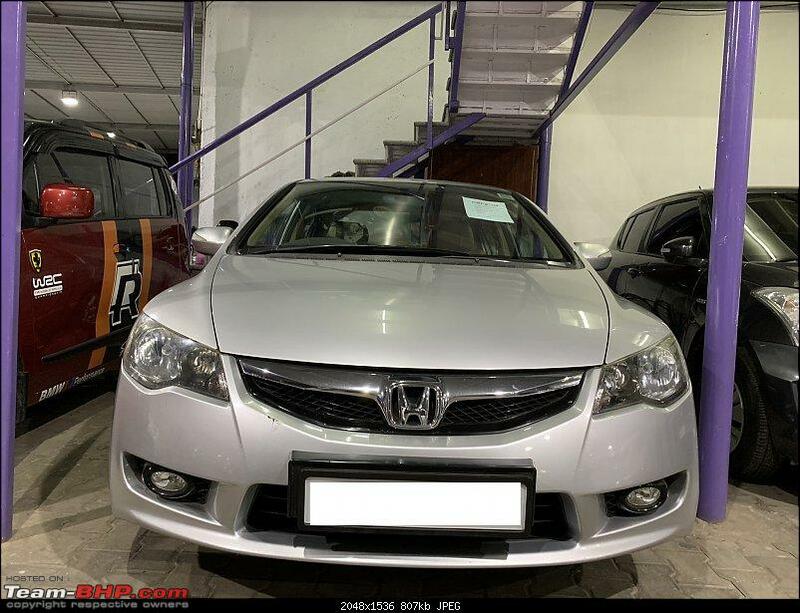 I negotiated a final price and immediately transferred the money to the dealer's account through RTGS. 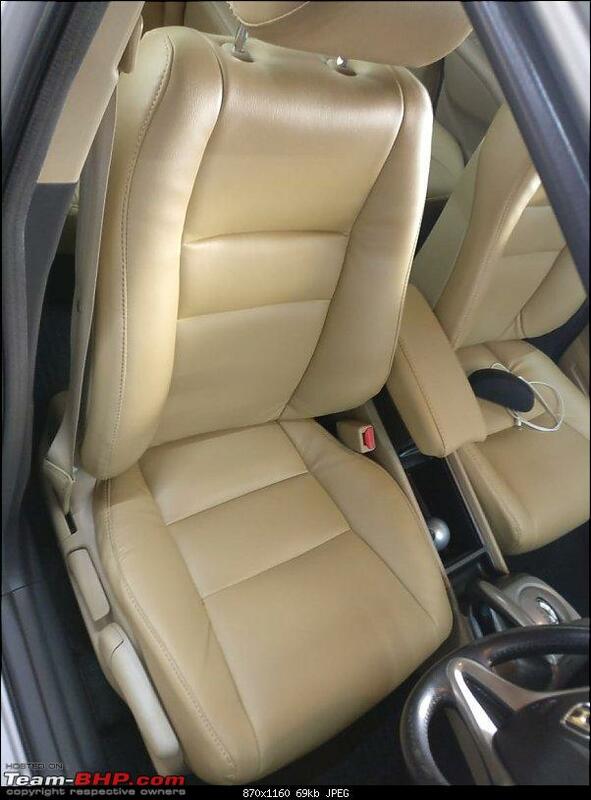 My parents liked the rear seats of the car and so did my grand parents. 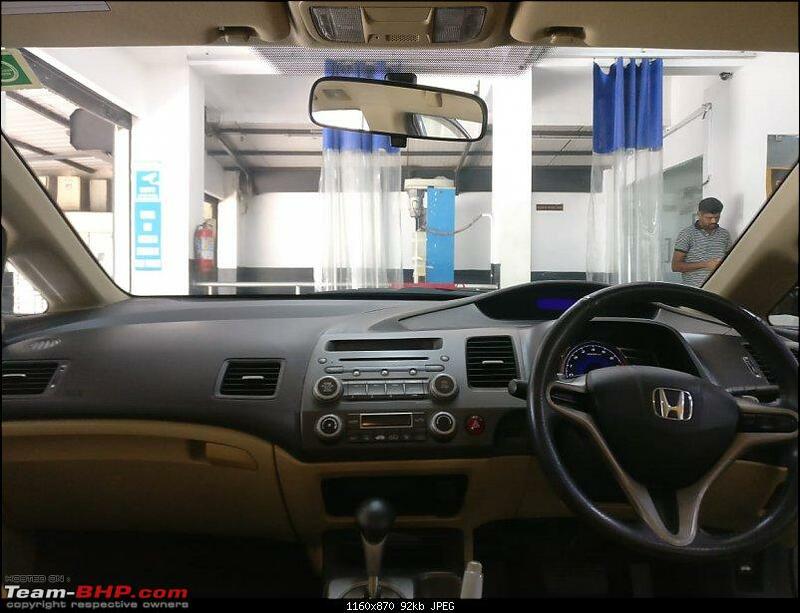 My grand parents told the car drives like Kappal (Tamil word for a ship) complimenting the ride quality of the beauty. I drove back to the dealership with my brother, dad and wife. All the paperwork was ready. In the meanwhile, the team at Carz4U cleaned up the car and installed a ribbon. I came out of the dealership and removed the ribbon immediately. I didn't want to say No and cause a scene there at the dealership itself. 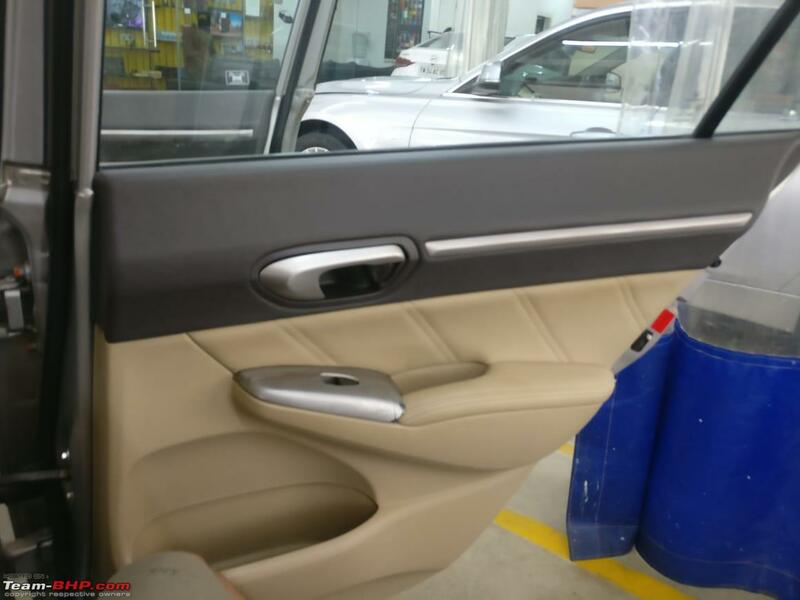 The next day, the car was taken to 3M for an interior germkleen and exterior wash and wax. Baptizing the legend. The right sticker I believe. My mom noticed how effective the speedo was on top of the dash. She said I need not divert my attention to see the speeds I was doing. I felt so accomplished when my mom, not a car person in any sense, can notice so many minute details of the car. The car would've been designed with a compass curve, I guess. One clean sweep! I have driven 1000 Kms so far and the car is really comfortable. 1. The car itself. It has been a dream and the fact that I own it, I pinch my self hard to believe. 2. The overall design of the car. Every car will have one or two good angles to look at. 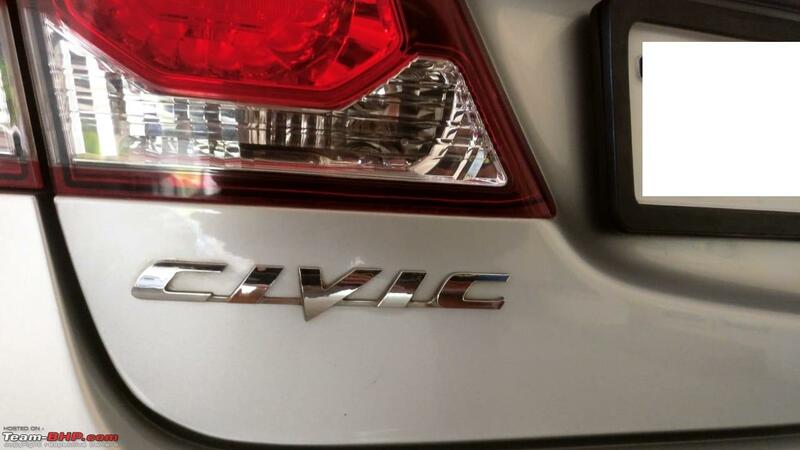 But, civic in particular, has no bad angles in my opinion. 4. The air conditioner is a chiller. Even the rear seat occupants are happy on a hot summer day even without rear AC vents. Also, the cabin cools down in no time even after being parked in the hot sun. 5. The auto box, though a bit sluggish, masks the weak low end of the engine. The paddles help both when you need a quick shift and also during engine braking. 6. The brakes. With discs all around, the car has amazing stopping power and can shed speeds quite well. Also, the pedal has a progressive feel to it and I can manipulate the braking action quite easily. 7. The heavy steering is confidence inspiring at speeds. 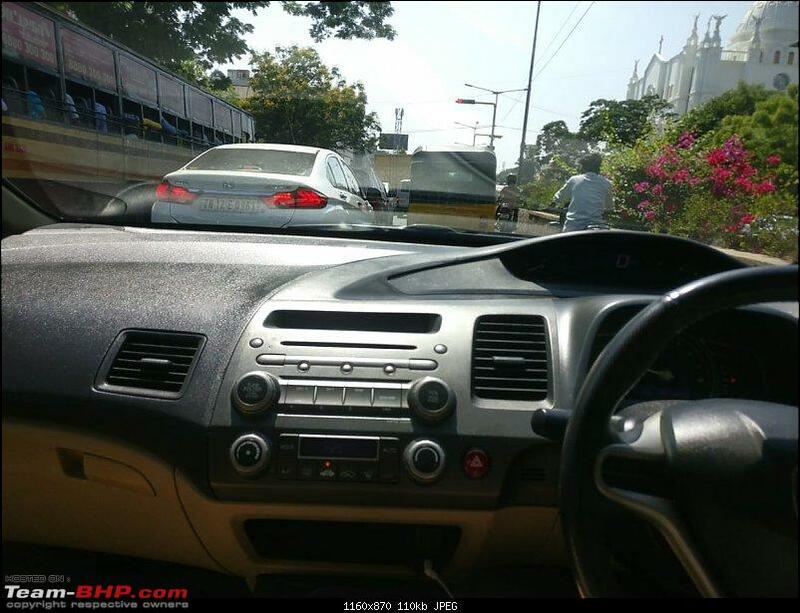 Though it is not as direct when compared to the Punto, it feels better than the Vento steering. 8. The sheer amount of space within the car. I can sit myself behind myself and still feel comfortable. Not the case in the other two cars I own. 9. The seats themselves are supremely comfortable. I would have just liked a little more under thigh support at the rear. 10. The overall ergonomics of the cabin. Everything falls to hand very easily. 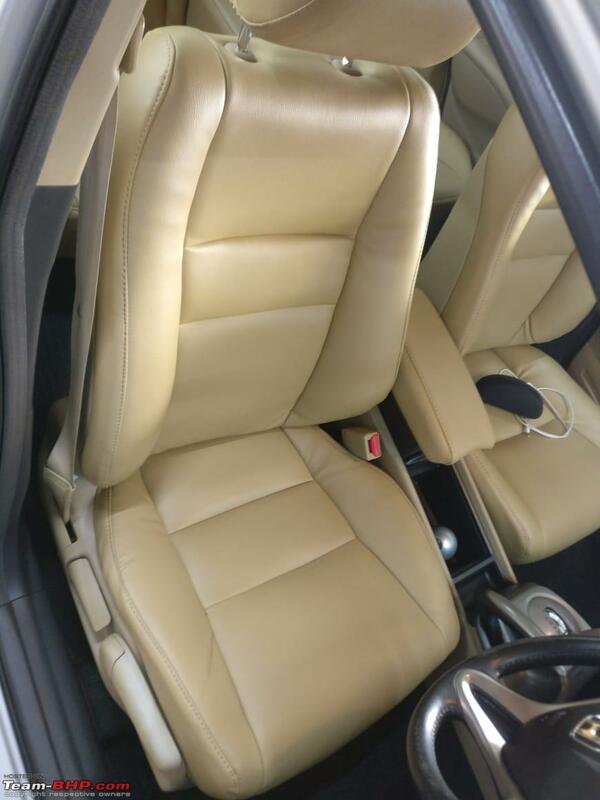 Also the wide range of adjustments for the seats, the tilt and telescopic steering wheel adjustments, help find a comfortable driving position pretty quickly. 11. The large ORVMs, help provide a great view of the outside. 12. The A pillar though thick, doesn't hamper visibility at least from my driving position. 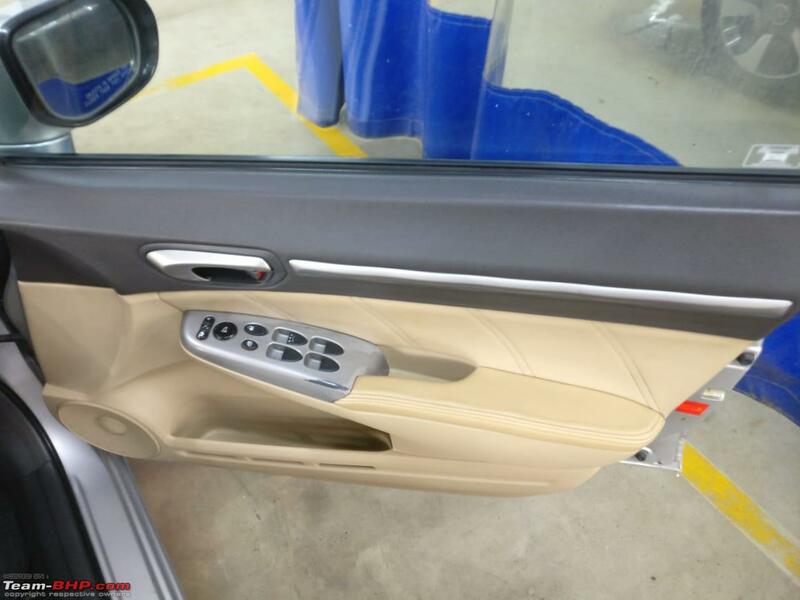 The frontal blind spots are very minimal. 13. 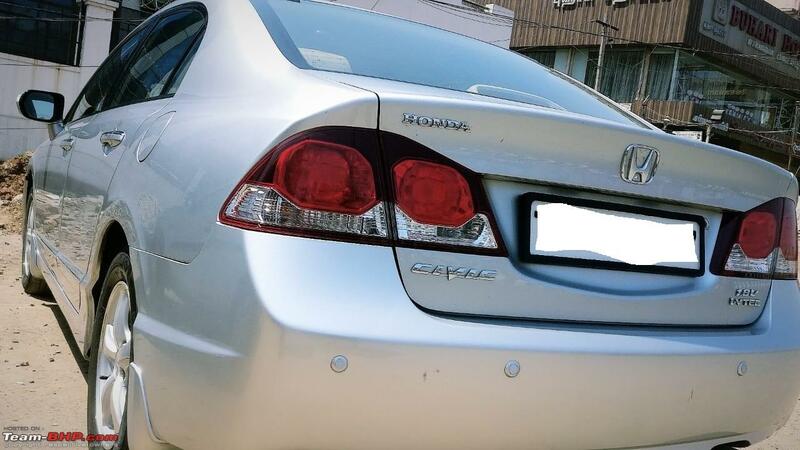 The octagonal tail lights, look classy and modern at the same time. 14. The Michelin P3ST rubbers. I had a dilemma sometime back between P3STs and the MC5s when I had to swap tyres for my Vento. I chose MC5s. but, P3STs feel more pliant overall. 15. 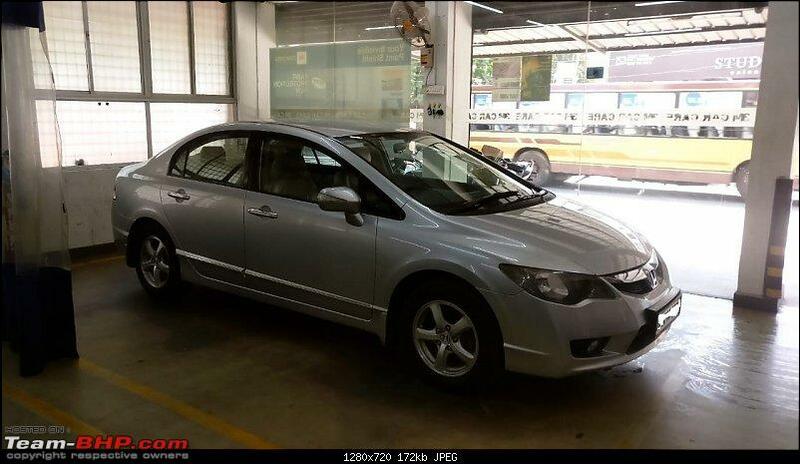 Matured ride and handling package. Not an absolute handler, at the same time, not a boat either. 16. The mod friendly nature. i already have sources for every possible mod with the car. I will start doing it with time. I plan to drive it pure for a while now. 1. Egress for elders due to it's low slung stance. Though no complaints so far, I am sure it would be an issue in the long run. 2. The low GC, I am doubly careful whenever I go over a speed bump. I am not getting the sense of freedom that I used to get in the Vento. I am not even bringing Punto into the picture. It is a crossover with its 185mm GC. 3. Steering mounted controls absence are felt. I have to take my eyes off the road to change tracks and actions of that kind. 4. The car though better built than modern day Hondas, still feels light. The first feel is got when you open and shut the doors. 5. 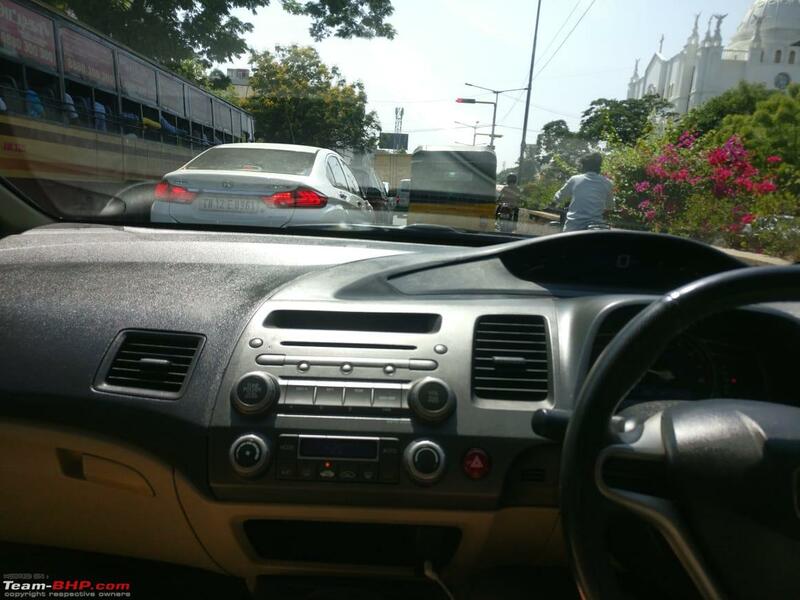 The windscreen, large and wide provides great visibility but, in Chennai, the amount of heat that gets in is significantly high. 6. 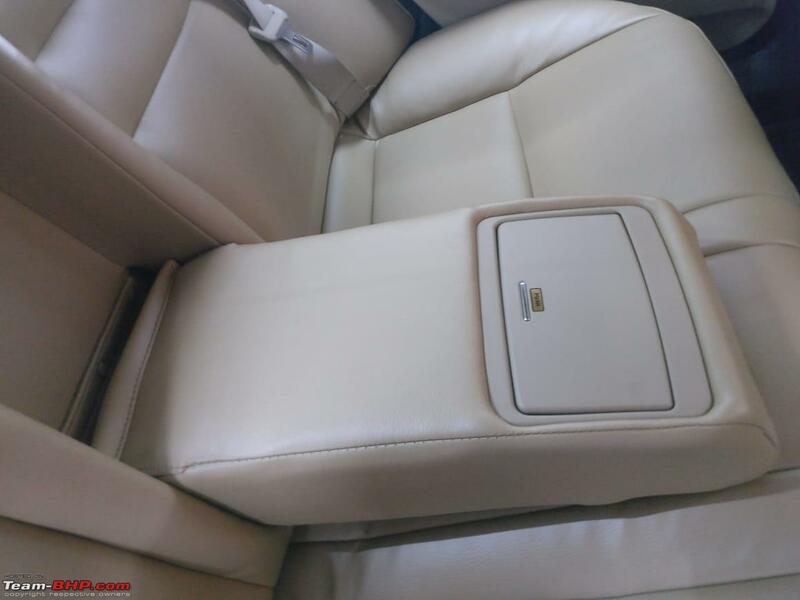 Though the rear floor board is flat, the centre passenger does not have the most comfortable seat and there aren't any head rests or 3 point seat belts. 7. The range of the tank. I am used to 700 Kms range from both Vento and Punto and the range of 300 - 350 Kms has increased my fuel station visits. I cover between 300 - 350 Kms a week and this means I will have to fill once in every week. Different level of throttle input up - shifts gears at different rpm. Feathering the throttle at in D, up - shifts gears at ~1500 rpm. Pressing it with a light foot shifts the gears at 2000 rpm. 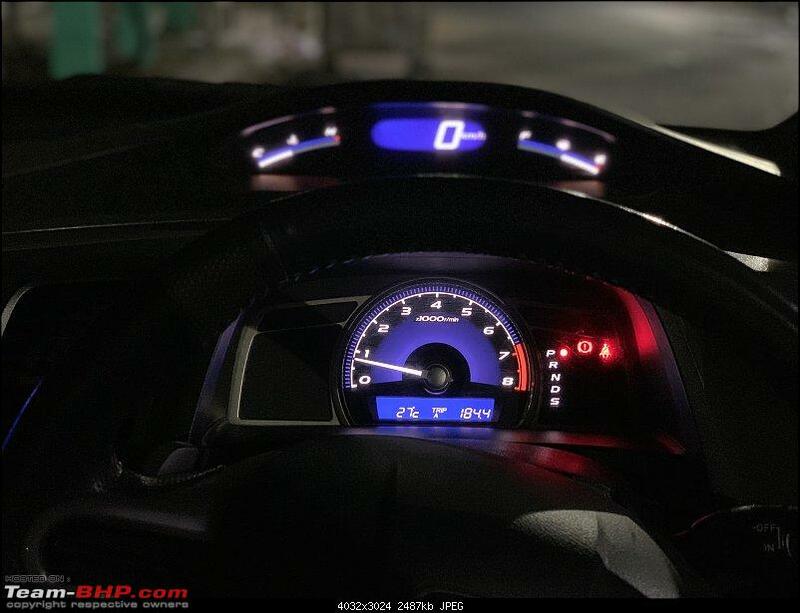 A little more at 2500 rpm and flooring the throttle in D, up - shifts at 3500 rpm. Engine braking could be achieved by using the paddles to downshift when slowing down, reducing the load on the brakes. I am yet to explore the full potential of the S mode. 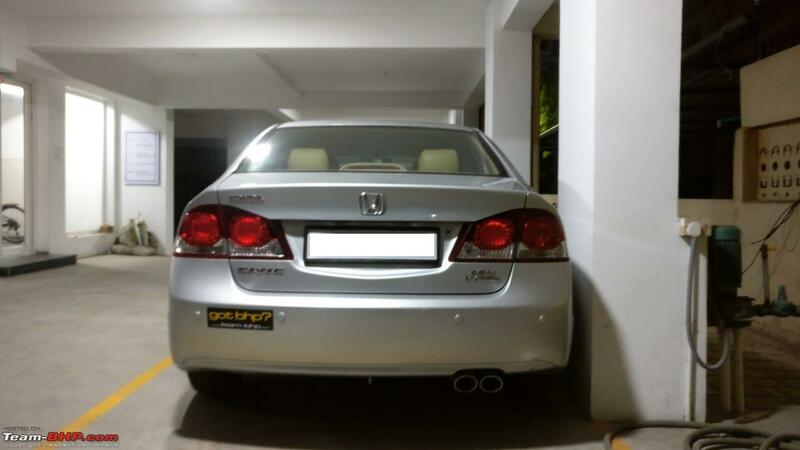 Car crawls up to speed of ~8 kmph without any throttle inputs. The engine is super silent up to 2500 rpm. Flooring the throttle gives a butter smooth roar from the engine. On flooring the throttle, the engine picks up revs and gear box is slow to react in comparison. This, I have experienced in my ex boss's cayenne diesel as we. So, no complaints here. I plan my increase my speed, shift a gear down using the paddles and then floor the throttle. It works like a magic and before you know it, you are doing ridiculous speeds. 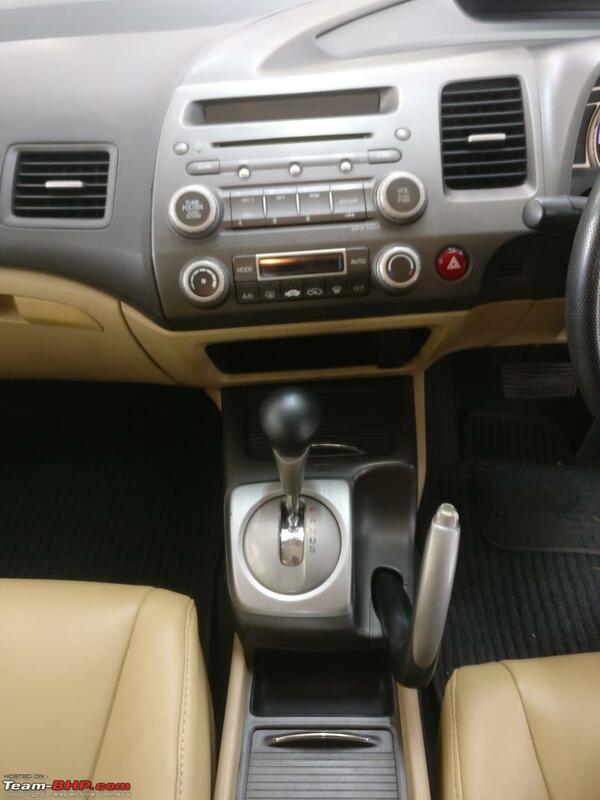 The gear box though sluggish, masks the weak low end of the engine which, otherwise is obvious in the manual transmission. The car masks speeds very well. 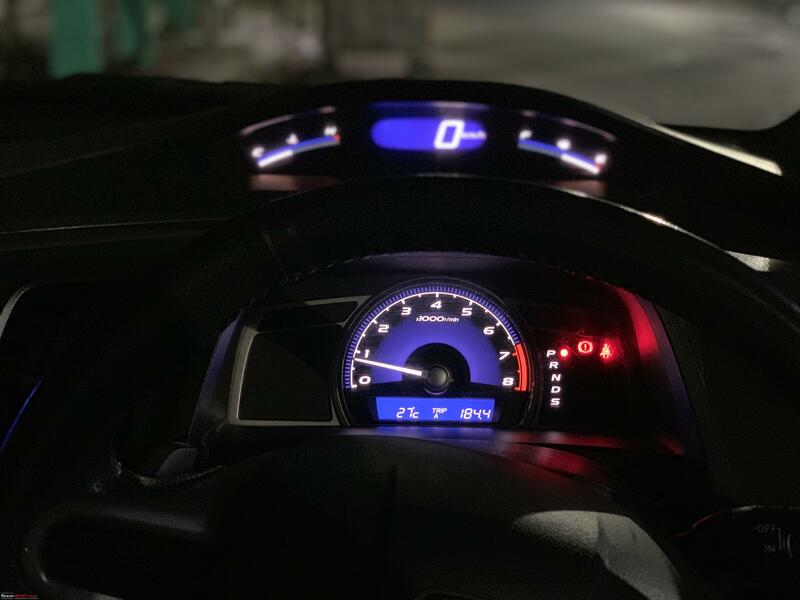 I ensure to drive her with a light foot in the city and I find the car between 55 - 60 kmph and engine ticking below the 1500 rpm mark most of the times. The Air conditioner is a chiller and works very well even without a rear AC vent. 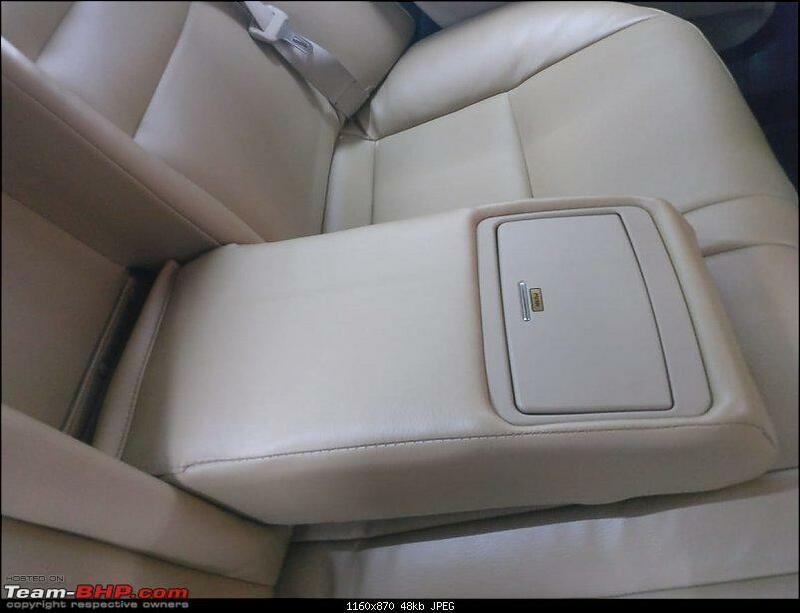 When I was a rear seat passenger for a while I could notice some air-conditioned air from behind the rear seat which is very comfortable. I searched for a vent but couldn't find any. There isn't any leak as well. Throw some light on this if any of you know something about this. The air conditioner is almost always set at 25 degrees and auto. When travelling alone, I feel cold and increase the temperature to 26 or 27 degrees after sometime. In comparison, Vento used to be set at 23 - 24 degrees when travelling alone and 22 degrees with full load of passengers. Overall, very impressed with the air conditioner's performance. The brakes feel super confident with discs all around. The pedals also feel progressive. Engine braking can be achieved significantly using the paddle shifters. When driving alone, the suspension feels a bit on the firmer side and with a full load of people, the ride quality is super pliant. 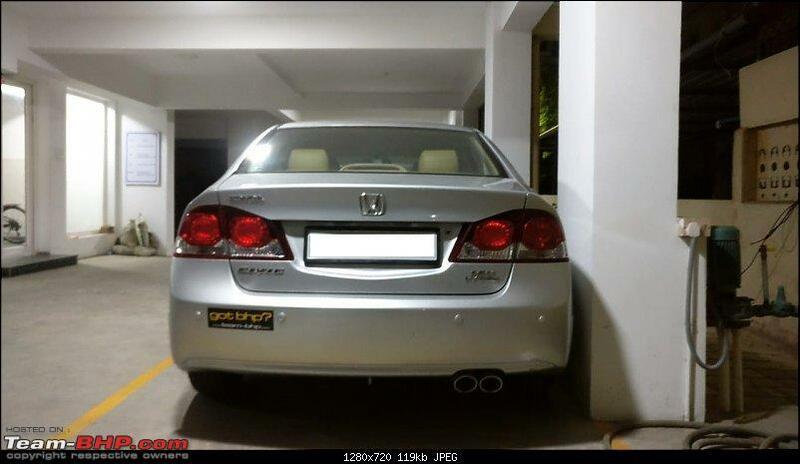 However, the rear goes too low with three people at the back and I literally crawl at ~1 - 2 kmph to cross the speed breakers. I have not touched the underbelly of the car anywhere so far. Hope it remains the same throughout my ownership, touch wood. I am yet to take the car to the twisties and fast corners on the highways. I'll update my review post experiencing them. 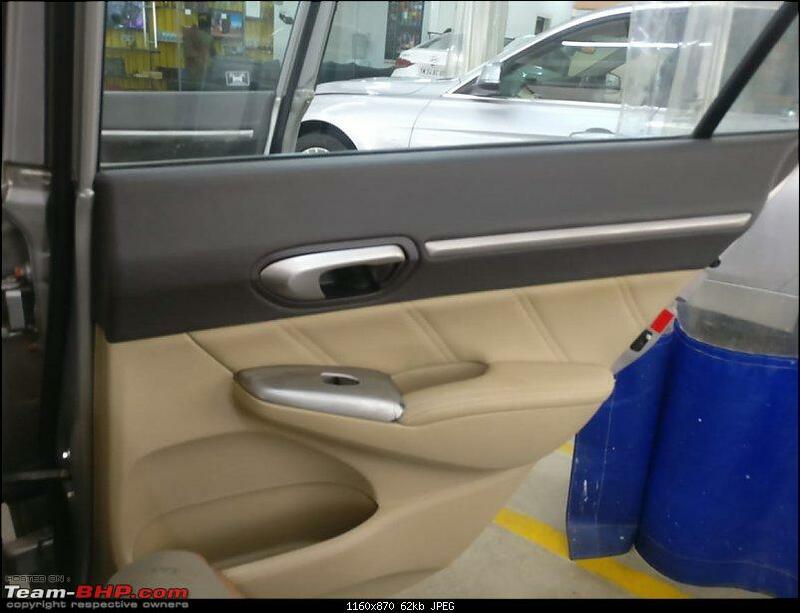 The car returned 7.95 Kmpl in the first tank of fuel. 8.67 kmpl in the second tank. All this was within the city. I'll update the highway efficiency figures once I take her for a long trip. The range is something that I need to get used to. I am used to 700 - 750 Kms range in the city with Vento and Punto, both being diesels. The 300 - 350 Kms range of the Civic means i will have to fill the tank every week. Not complaining, but, the car deserves a bigger fuel tank. With three tank averages so far I can safely say that the display FE figures show ~1.1 kmpl more than the actual FE being returned by the car. The RC has been transferred to my name in within a week and the dealer has applied for insurance name transfer. Overall a great experience so far that i'll take to my grave. Thanks for reading. Hope you have enjoyed it. Apologies if I have missed/ messed up anything in the post. I will keep updating the post with my ownership review from time to time. 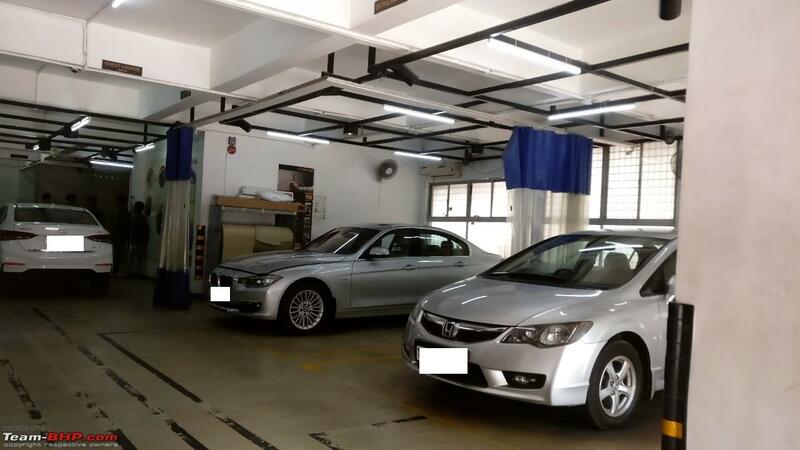 I am planning to keep the car as long as it is legally allowed to drive IC engined vehicles. Also, I will keep performing some thoughtful mods with the car. Few parting shots to end the post. Congrats man! Your post brings back memories of my Civic. This model is trading hands at really tempting prices. And somehow, it doesn't feel outdated even today in terms of design, space, power etc. Congrats, NTO on finding that right car ! It is not every day that one finds a car that one wants, and in the right condition. Also quite impressed with the approach of the dealer there. Wishing you many happy years and miles of ownership. The car may get less convenient for the elders with time, but you can always get them another more suitable car. This one can be with you for a long time. 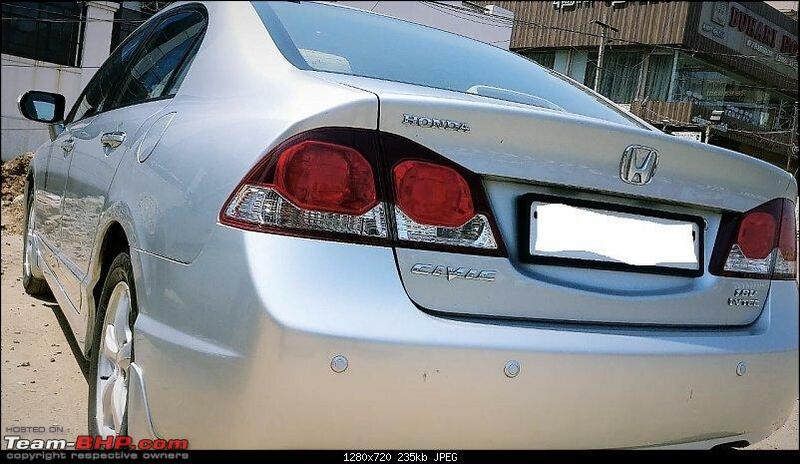 After all, it's a Honda. 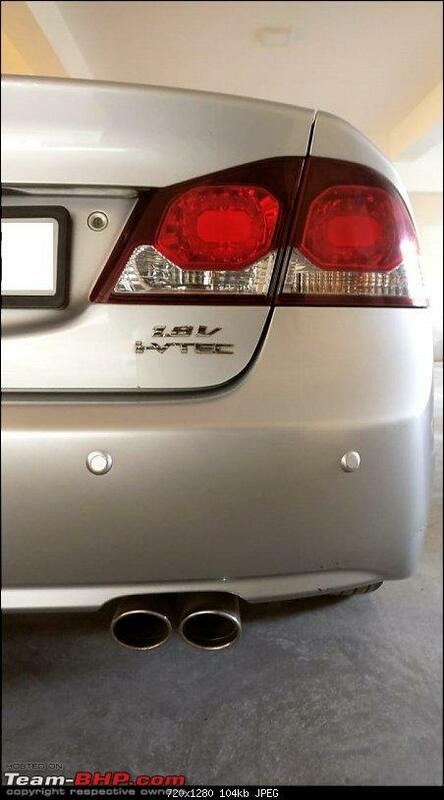 A Civic. Congratulations man! This is one car design that simply does not age. Mind sharing what you paid for it? Check out the Roger suspension buffers on Amazon Link. They should help with the low GC and consequently ingress and egress. Heartiest congratulations NTO. 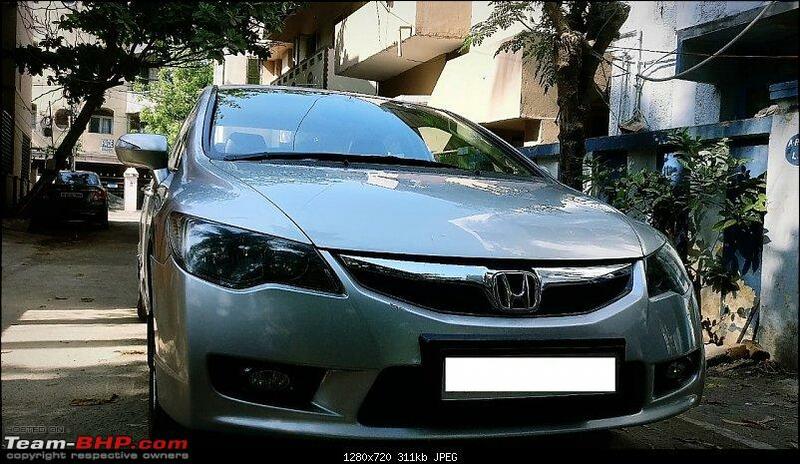 Wish you countless memorable miles with the reliable Honda! Even after so many years, the design is such a head turner. I walk a lot, so everytime I look at a well maintained Civic, I can't resist looking back. I would love to own a pre-worshipped Civic, unfortunately my family does not agree with my thought process. Hope to see a lot more of this beautiful car through your updates. Lovely ownership review man .. Dealership chap looks to be a very nice guy, knows a thing or two about customer service. And the car is maintained in a very good condition by the first owner. Wonderful purchase! What a wonderful time and market to be living in. 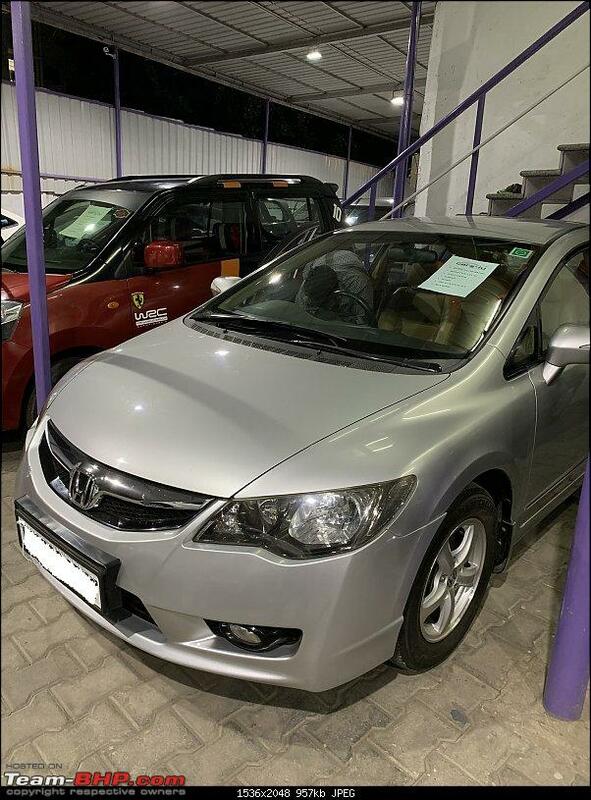 Cars depreciating so fast and such pristine examples available for mouth watering prices. Also, do you mind sharing the price for which you got this beauty? Last edited by DeepakS : 13th April 2019 at 13:46. 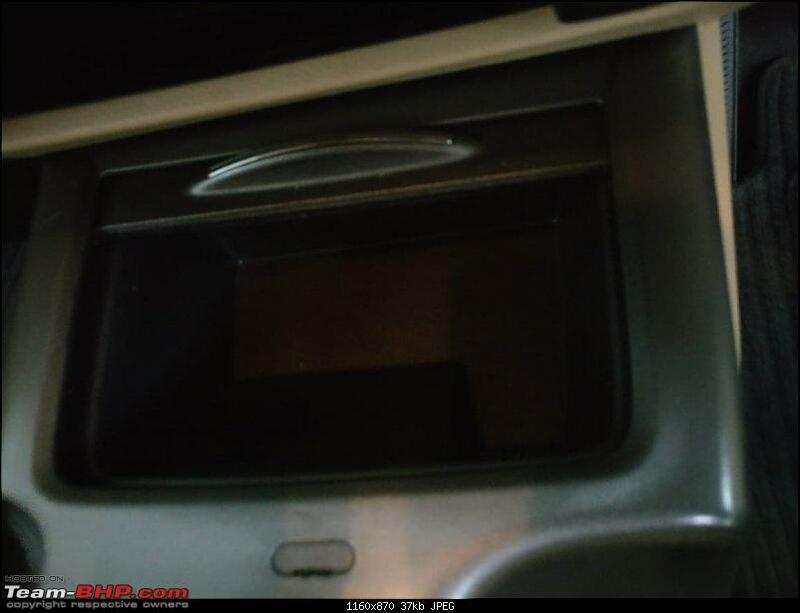 Hey NTO, I have my sights on a 2013 sample of a V A/T with sunroof. It's done 35k km. What should be the maximum I should shell out for it? Not too many references of the same config around. We have had a Civic AT for nine years. A fantastic deal. We could have thought about replacing it with another Civic next year. However, having the old engine puts me off. I would have liked a 1500-1600 unit with Turbocharging. Let us see, in 2020 when BS-VI kicks in. Congratulations on the purchase. A wonderful car and had been one of my dream cars for a very long time. That interest has worn off a bit, but I still hope I will buy one at some point just to realize that dream especially since there are some great deals to be had. NTO amazing car and your’s is a well maintained example. 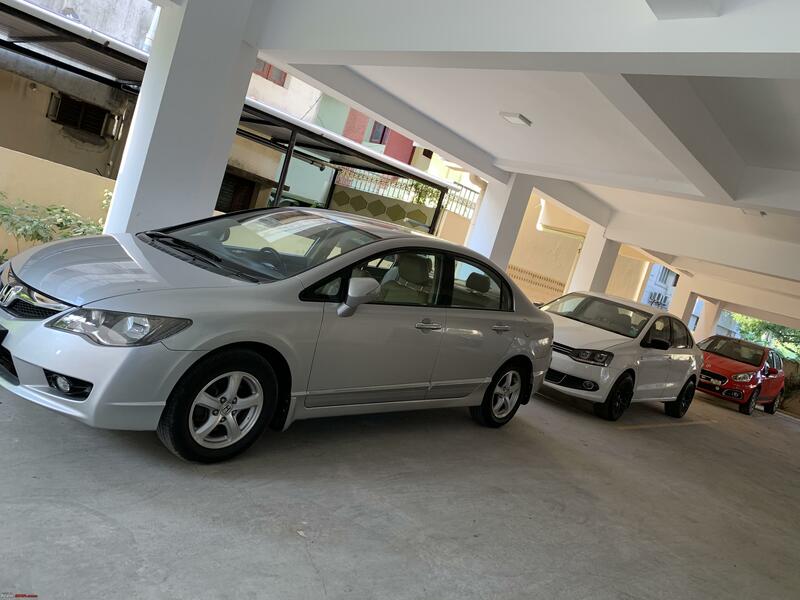 Way back in 2012, I was in the same dilemma , I went and took a test drive also, however, I was sold on cruze and bought a used Cruze and never did regret. But I must say, the NA there is a beauty. A great looking car NTO! Always a bonus to buy a car with such an impeccable record. I too was tempted, and finally bought a Civic in October 2017 from a close family friend. There are a lot of things to love, the smooth engine, and great seats, the looks (!). Sadly for me, I never got comfortable with the car. I like feeling planted at high speed and coming from a line of Germans/Europeans, the lightness of the body and the (comparatively) fluttery ride was something I couldn't live with. Now, every time I see a clean Civic (like yours! ), I feel very silly for not being able to enjoy it. Wish you many happy miles! Last edited by Viraat13 : 14th April 2019 at 08:40. Congratulations NTO! The Civic is really a timeless beauty. This is one of the rare gems in the Indian market which just doesn't get old! Wish you many happy and safe miles!